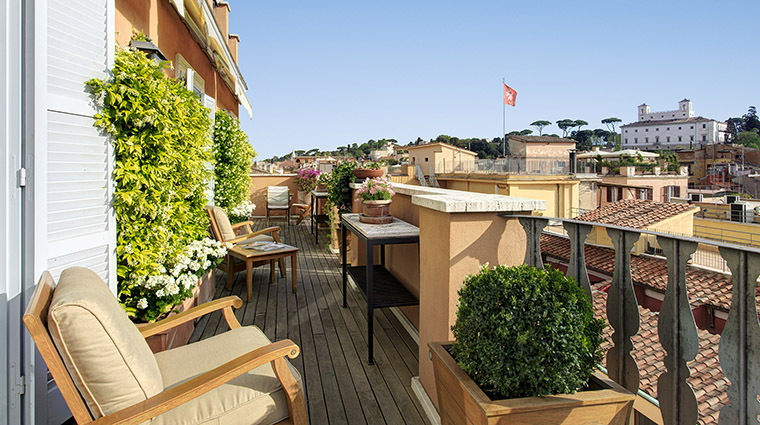 Make your Rome escape even more memorable with a stylish stay at Forbes Travel Guide Five-Star Portrait Roma — Lungarno Collection. 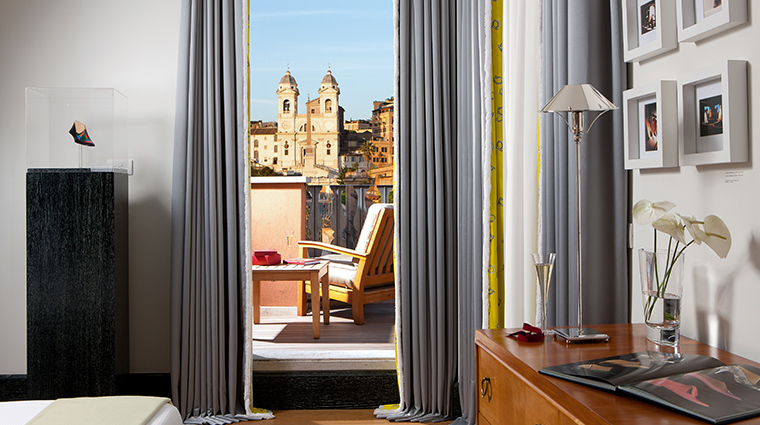 Book a two-night getaway in one of the Ferragamo-inspired hotel’s sumptuous suites and enjoy VIP perks, such as round-trip airport transfers, complimentary minibar access and an array of luxurious amenities. 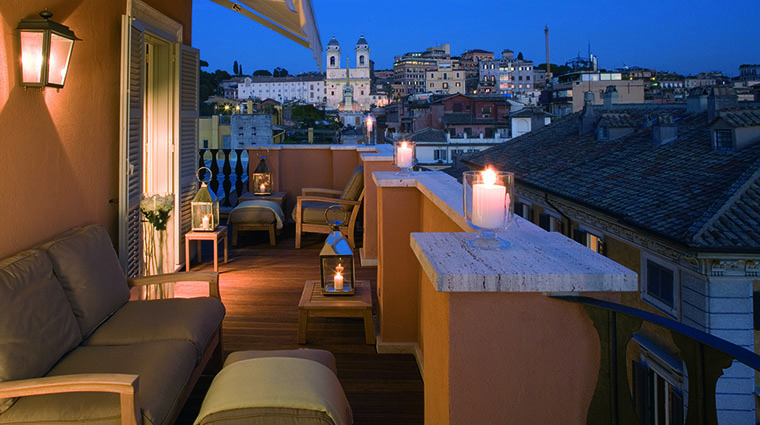 Plan a three-night escape to also receive a private two-hour tour of the Eternal City. Three-night minimum stay required for the tour, and two nights for the suite promotion. 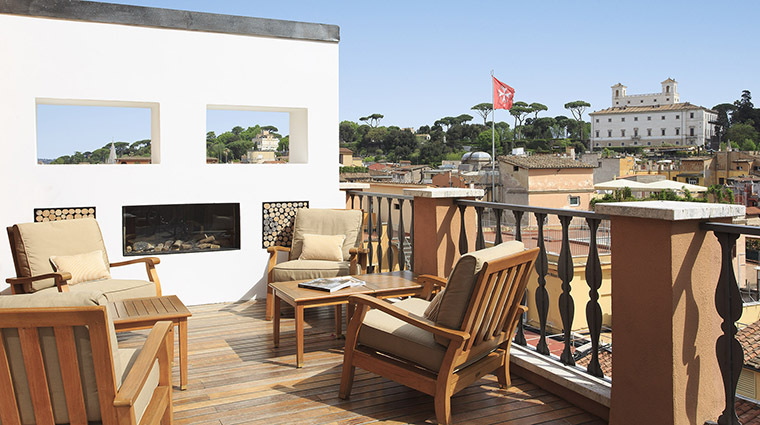 One of the best addresses for a weekender in Rome is Portrait Roma – Lungarno Collection. 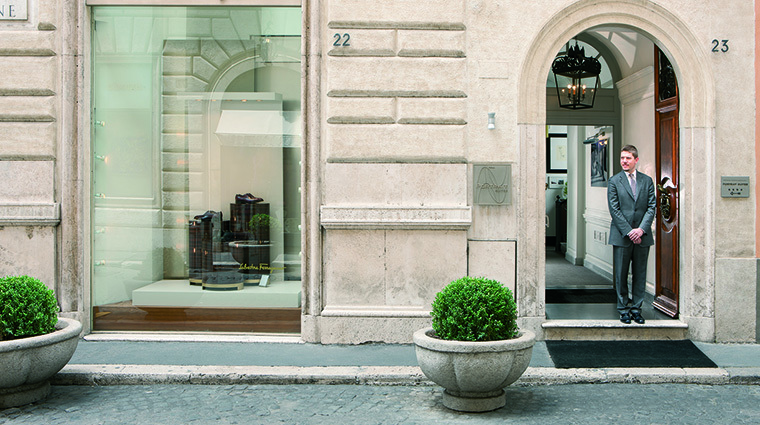 Boasting a coveted corner on Via dei Condotti, the Ferragamo-inspired Portrait Rome is both a luxury getaway and gateway to fashion. 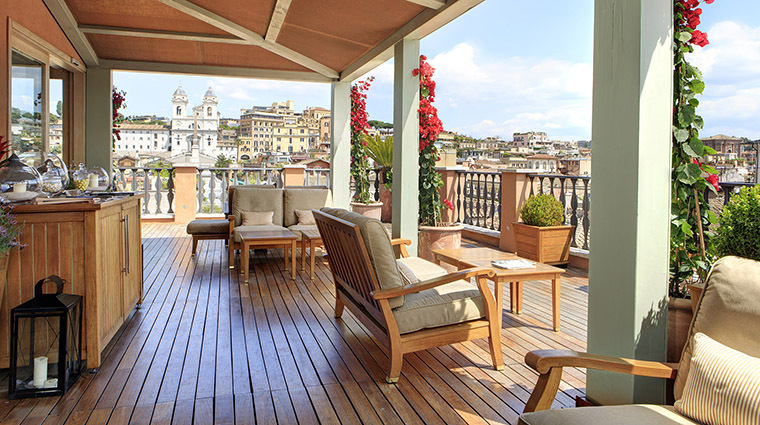 The 14-room property was designed by Michele Bonan to showcase the Ferragamo lifestyle and its love of Italian artistry, all while providing the proverbial key to unlocking all of Rome’s best doors. 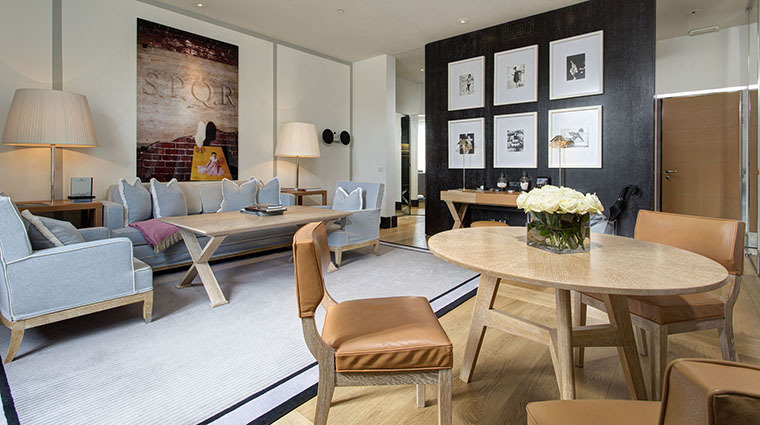 First and foremost, Portrait Roma is stylish with magazine-worthy interiors. 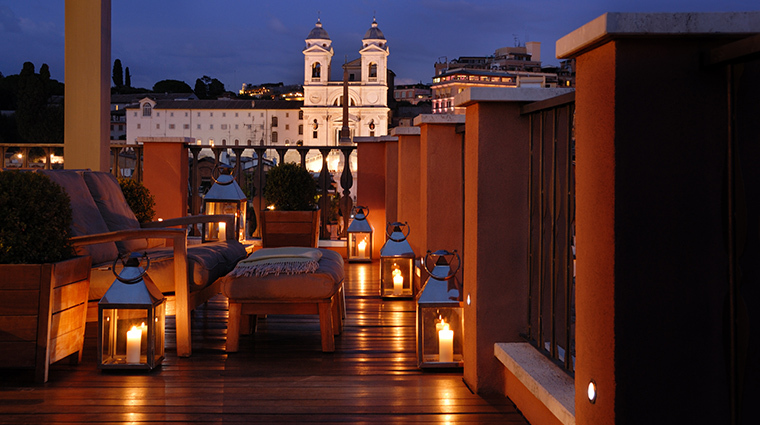 Each of the Rome hotel’s 14 rooms and suites is a fashion-forward, haute design masterpiece. Ferragamo's love and commitment to the artisanal also shines through in the details, such as hand-stitched leather. 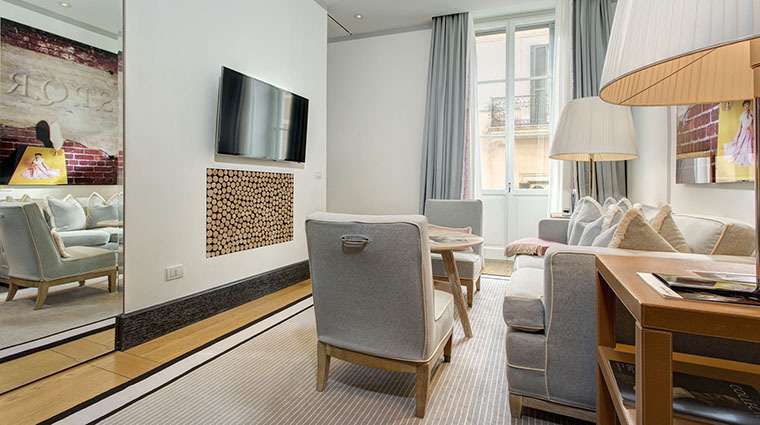 From its design to its guest services, Portrait Roma’s main concept is that it is more of a home or a pied-à-terre than a hotel. The 24-hour lifestyle and guest assistant teams (a group of six incredibly well-versed and multilingual staff members) reach out immediately upon reservation with a thorough questionnaire and arrival form that asks for basic preferences such as pillow firmness and room temperature to the nitty-gritty such as preferred evening music. 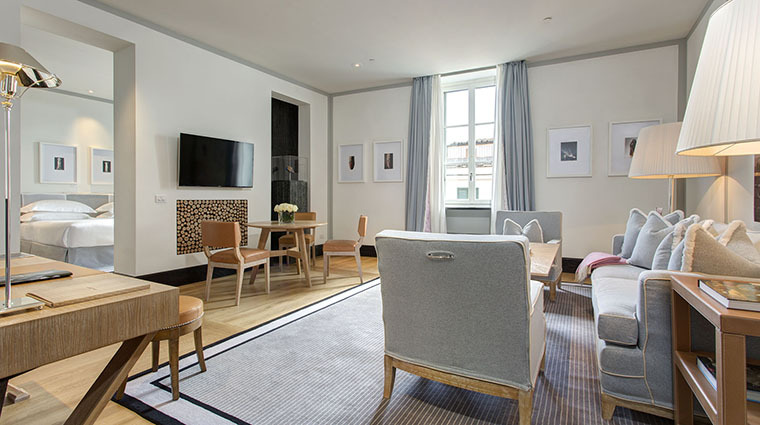 Peruse your personal iPad in your room with its 20-plus curated menus (which change monthly) for activities from food and drink to shopping and sightseeing. 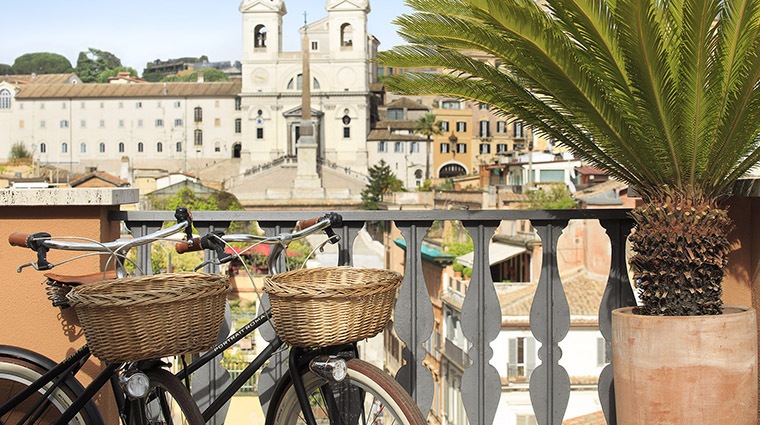 Though Piazza di Spagna, Portrait’s neighborhood, may be piquantly busy during the day, the area quiets down to practically a standstill at night. Staff members will intently focus on creating a bespoke experience tailored to your desires. The lifestyle team can organize practically anything you want. 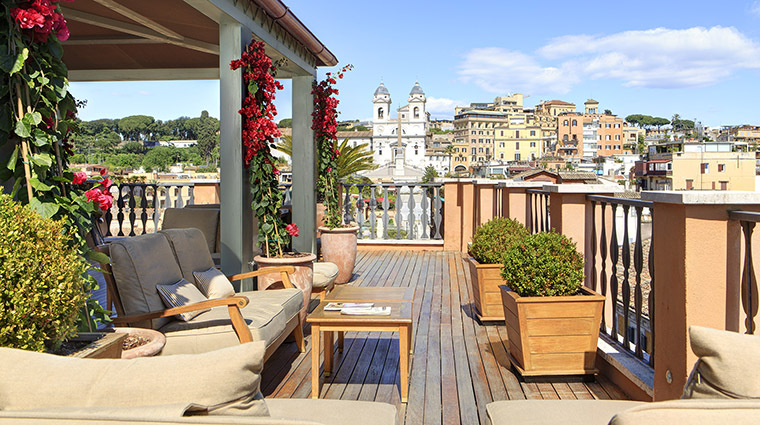 Though the luxury hotel does not have its own restaurant, it has a beautiful terrace, open from mid-March through September, that serves a buffet breakfast, light lunch and dinner, and cocktails. 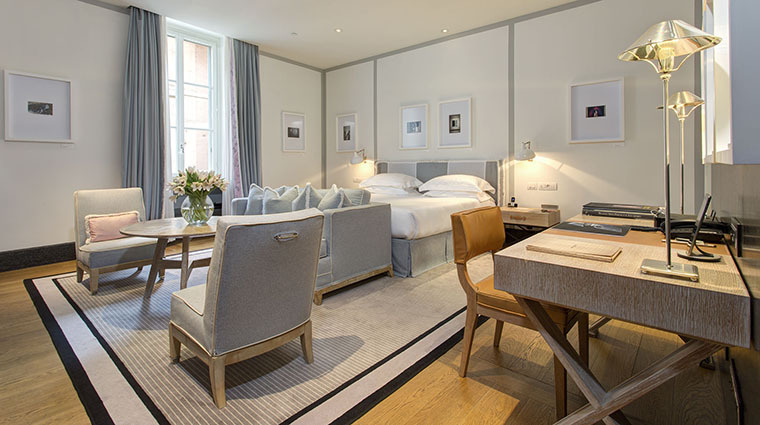 With ecru and gray as base colors, the accommodations are harmoniously balanced with beautiful contemporary pieces that are inspired by Salvatore Ferragamo’s personal style. Handcrafted cabinetry, soft leather couches, Ferragamo linens and a vintage-style record player add a stylish design aesthetic. 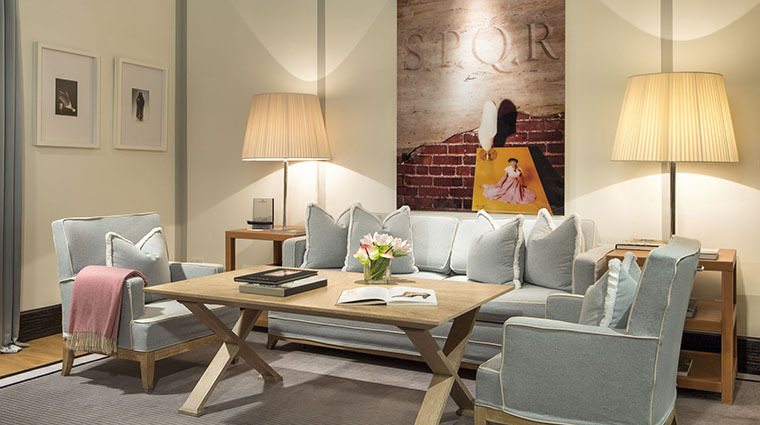 Photos of 1950s Rome and sketches of Ferragamo’s shoe designs adorn the walls. 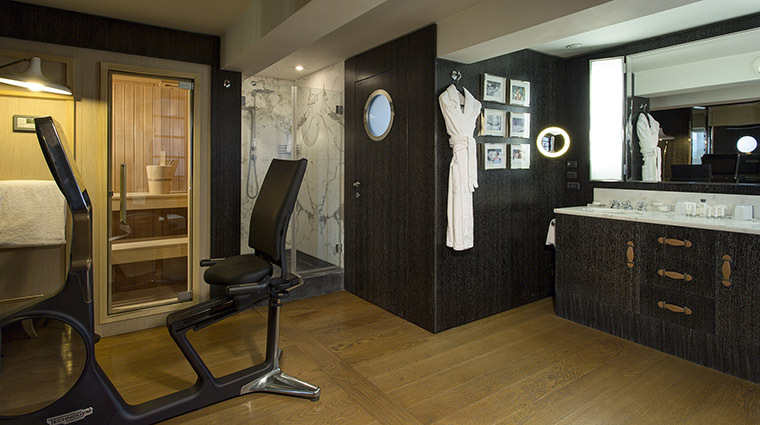 Each bathroom has personal fitness items, top-brand hair dryers and flat irons, and products from the Ferragamo beauty line. Fashionistas will agree that it doesn’t get any better than Via dei Condotti, Rome’s historic and exclusive fashion street. 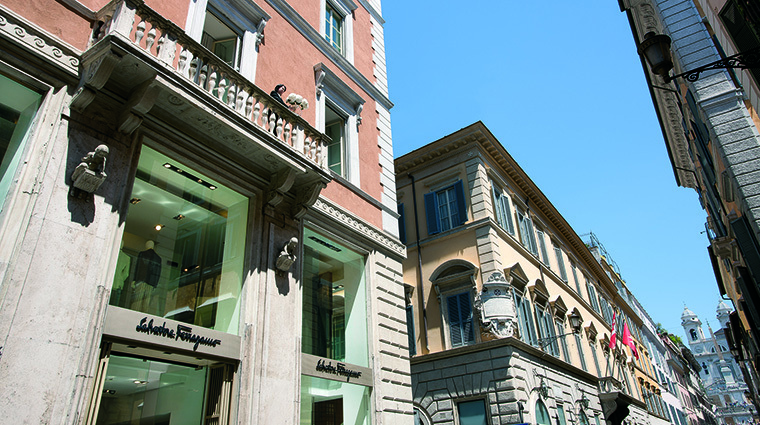 Ferragamo, Gucci, Dior, Cartier and Prada, among others, are clustered together here, while the surrounding area is peppered with boutiques and cafés. Rome’s must-see monuments and piazzas, including Pizza Navona, the Pantheon and the Trevi Fountain, are all within close walking distance. In just a 10-minute walk northeast, you’ll find yourself in the historic center’s biggest (and greenest) park: Villa Borghese.